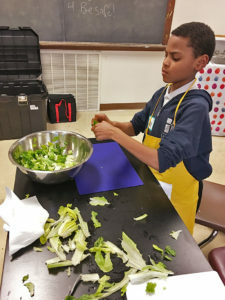 In the spring, students in grades 4-7 participated in a 10-week Cooking Lab led by Vetri Community Partnership. Students received hands-on culinary experience while learning about the nutritional value of the food they made. Recipes included carrot cake pancakes with cinnamon applesauce, corn & scallion griddle cakes, vegetable crudité with homemade ranch dip & hummus, and many more! The Vetri Cooking Lab concluded with students preparing a dinner for their parents on site! This summer, students in Senior Camp participated in a week long True-Life Adventure (TLA) class of Culinary Arts with Vetri Community Partnership. The program allowed students to lead healthier lives through hands-on experience and education about healthy food during interactive cooking classes. Dishes included arepas, breakfast burritos, zucchini pappardelle with tomato sauce. Students made each dish from start to finish, learning about how to properly prepare it along the way.